A region-by-region preview of what to look for at the regional championships this weekend and who we're likely to see at the state meet. Three runners with season bests under 18 minutes headline the group of 3A Region 1 girls. Chiles senior Lily Williams finished as the state runner-up a year ago and has only finished second once this season in six races. Williams owns the 1600 and 3200 meter championships in the last two state meets. She is the favorite, but will be challenged. Teammates Carly Thomas who has a cross country state title to her name and Rachel Givens are expected to be in the lead pack along with two standouts from the Panhandle in Ivy Chastain and Marsel Mosley. Chastain has the better time on paper, but Mosley edged out Chastain last week at districts and the week before at the county championships. Chiles is looking for its fourth consecutive state championship, but 2011 won't be easy as in the past. Creekside led by twins Kaitlin and Lauren Rodriguez have solid depth in their number three and four runners as well. Fort Walton Beach hopes to capitalize on Chastain's success and ride that momentum through their top five. Chiles top three are just too powerful to overtake and could possibly all finish in the top five at the regional and possibly top ten in the state. The problem is after that the spread between three and five. I don't think it's a problem this weekend, but it will keep things a little too close for comfort. Niceville, Nease, and Choctaw, fight it out for the final team spots. Nease senior Mac Reynolds is coming off two stellar performances where he set course records and being named Warrior of the Week. Reynolds biggest competitor will be Niceville's Thomas Howell who has been one of the Panhandles best and brightest young runners. Reynold's has a season best of 15:22 nearly 13 seconds faster than Howell. Both run extremely hard and are fierce competitors, but after talking to Reynolds and his coach this week he has a fire in him and feels a little disrespected after the latest FACA rankings have him under Howell. Howell's teammate Nicholas Morken also figures to be in the mix as well as Tim Bulger of Fort Walton Beach, Jacob Kotick of Booker T. Washington, and Christian Taylor Buzzard of Chiles. Fort Walton Beach should place Bulger in the top five and most of their top six could cross before most teams have their second runners past the line. The battle for second will be between Booker T. and Chiles which could come down to their fifth runner. After Leon and Bartram Trail who gets the final spot is a complete tossup. This week's Warrior of the Week Anne-Marie Blaney looks to keep peaking during the postseason. Last week the Belleview senior won the 3A District 6 championship over Wiregrass Ranch junior Nikita Shah. Shah will have a chance at revenge this weekend to take down Blaney, but I think the senior is just too strong. Coach Pfriender says she doesn't have the best kick in the world so she will need to get out early. Shah hung with her thru two miles and then it was game over. I think this one plays out the same way with Blaney taking home the championship. St. Cloud senior Ashlyn Stradtlander should round out the top three. St. Cloud and Wiregrass Ranch will fight for the team trophy. The Bulldogs are a deeper squad and the difference will be their number five runner, Ashlyn's twin sister, Katelyn Statdlander. Belleview, Steinbrenner, Mitchell, and East Ridge are the other teams to qualify for state. Of the five times Max del Monte and Quincy O'Connor have met on the cross country course del Monte has won four. Del Monte seems to peak when it matters the most and this year is no different. He won the Hillsborough County Championships over some tough competition and won the district meet last week. He said his fourth place performance at Pre-State would be a breakout race and it has been. O'Connor hasn't seen as much competition running in Osceola County, but he came from New York and has been doing some intense training this week leading up to the big event (see blog). O'Connor will hang for the first mile, but then Max kicks it into another gear. Both these runners will be in the top ten at states. Travis Nichols of Land O'Lakes and Sam Hippely of Wiregrass Ranch will duke it out for third. Hippely and Wiregrass Ranch are favored to take the team title ahead of Hillsborough County counterparts Steinbrenner. Sarasota, Chamberlain, and Land O'Lakes round out the top five with St. Cloud likely getting that sixth spot. The top two juniors in 3A go at it for the seventh time this season. Estero's Kacy Smith and Lakewood Ranch's Olivia Ortiz have had some great battles this year and Ortiz has won all, but the first one at the Deja Vu Invitational. The loss was only by three-tenths of a second. This season Ortiz has become a household name beating out the top runners regardless of class at both the flrunners.com Invitational and Pre-State. Last week she crushed Smith by forty-three seconds. The good news for her is she won the bad news I think it will light a fire in the Estero star and last year's 2A champion to step up her game. Nobody is going to underestimate what the other can bring and will be on their "A" game if they want to take home individual honors. Fort Myers senior Rachel Petrik, Gulf Coast senior Caroline Barlow, and Osceola's Alexis Irwin are the only runners who might finish in the top ten not wearing an Estero or Lakewood Ranch jersey. Ortiz might have won against Smith last week, but Estero won the war against Lakewood Ranch and have all season. Coach Summer's team is not only the best team in this regional, but perhaps the whole state regardless of class. Smith is their number one runner but their team is loaded with depth in Bethany Jenkins, the Solis sisters, and Maria Frank all running under 19:30. Lakewood Ranch wasn't in full force last week and will have a healthy Kristin Zarella and Devin McDermott to go along with Ortiz. Fort Myers, Gulf Coast, Ida S. Baker, Northeast, and Cypress Lake are expected to move on as well. This will be a great race between Carlos Miranda of Palmetto Ridge and Aaron Rojas of Estero. Miranda barely beat Rojas earlier in the year at the Fort Myers Optimist meet and has two narrow victories at the flrunners.com Invitational and Pre-State where he placed third in both. The conditions are expected to be ideal for this meet on Friday morning which could lead to some fast times. Miranda proved in both those meets that he could hang with some of the best like Elliot Clemente and Andres Arroyo and Georgia state champion Josh Brickell. Miranda will win but he will be pushed by Rojas and I don't think it would surprise a ton of people if Rojas beats out Miranda in the end. Buddy Gates, Joshua Pelletier, and Aesop Brown will be contenders as well. Charlotte's Ryan Schnulle could be a dark horse. We haven't heard much from the senior after a stellar 2010 cross country and junior track season, but you can never count out one of Coach George's pupils. Estero, Fort Myers, and Naples will be neck and neck for the team trophy. Estero is the reigning 2A champions and are in 3A for the first year. I'm calling the upset pick here and going with Fort Myers. The Green Wave have nothing to lose and are going leave it all out there. It's cliche but if you want to be the best you have to beat the best and that is what Fort Myers wants. Naples will be right there in the equation as well. The next three spots could go any which way with Ida S. Baker, Palmetto Ridge, and Charlotte. Melbourne senior Vanessa Valentine is the clear-cut choice to win 3A-4. Valentine comes in with a season best time of 17:43.00 nearly a minute better than Merritt Island junior Elizabeth Harper's time of 18:51.70. Only two other runners have times under twenty minutes. Valentine will control this race from start to finish with little competition. It will be interesting to see how she responds next weekend against the likes of Lily Williams, Kacy Smith, Olivia Ortiz, and others. Morgan Rodriguez and Rachel Greer round out your top four finishers. Merritt Island led by Harper has the depth to give them the team trophy. Melbourne strong up front with Valentine and Greer have a big separation after that, but still have enough strength to finish as runner-up. South Fork looks to finish a solid third. The remaining three spots could be between as many as seven teams. 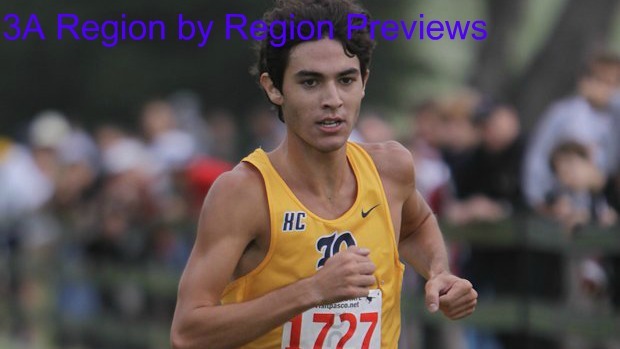 The question is not who will win, but by how much will Elliot Clemente take the regional championship and how dominant will his Belen team be? Clemente is one of the top runners in the state regardless of class and one of the top runners in the nation. His Belen team is a powerhouse and have dominated the state meet the past couple of years. Clemente comes in with a season best time of 15:02.70 nearly thirty seconds faster than teammate Avery Lopez who is predicted to come in second. Pembroke Pines Charter sophomore Andrew Iglesias has flown under the radar a lot this year, but can make some noise at this meet finishing in the top three and breaking up the Belen onslaught. Belen will win and win big. Other than Iglesias the Wolverines are going to place their top seven runners before anyone else in the whole meet! Melbourne should take the runner-up trophy followed by Martin County, Jensen Beach, Port St. Lucie, and Archbishop McCarthy.